From June 26th through July 2nd, you can save more on Himalayan Dog Chew (Hard cheese stick chew). Himalayan Dog Chew (Hard cheese stick chew;Made from Yak and Cow Milk,Salt,Lime juice ) made in Nepal,Packaged in US. Hers in the picture above is Large size. Lets watch Palette in action with Himalayan Dog Chew Large size in her taste testing video below. Himalayan Dog Chew are available in 4 sizes;Small 3.5 oz (3-5 pieces/package), Large 3.5 oz (1 piece/package), XLarge 6 oz (one piece/package), and Big 7.5 oz (1 piece/package). The milk used to make this chew is from Yak and Cow that graze on grass field or the ones that were fed all natural leaves from forest. The chew has slight odor,almost like smoked cheese, and I find that the chew lasts longer than average bully sticks for our medium chewer dog “Palette”. She chews approx 1″ per 20 minutes chewing time. Small: 3.5 oz (recommend for dog up to 20lb)Each chew is approx 2.5″-4″ long, 1/2″ thick and one package contains 3-5 pieces of chew to make it to 3.5 oz weight. 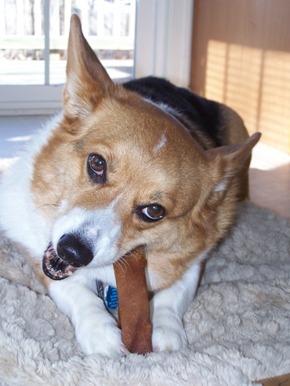 Large: 3.5 oz (recommend for dog 20lb and up) Chew is approx 5″-7″ long,3/4″ to 1″ thick. One package contains one chew. 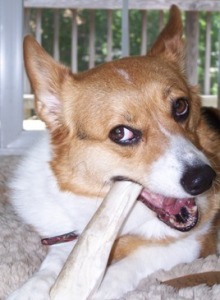 XLarge: 6 oz (recommend for dog 40lb and up) Chew is approx 5″-7″ long, 1″-1.25″ thick.One package contains one chew. Big: 7.5 oz (recommend for dog 50lb and up) Chew is approx 5.5″-7″ long, 1″-2″ thick.One package contains one chew. ** If you have aggressive chewer,it might be better to pick one size up or Big size. These chew will be perfect for those who are looking for chews that lasts longer than average bully sticks. These chew are tested at American laboratories for its content. You can read more on Himalayan Dog Chew in the taste testing entry titled “Palette’s note:Himalayan Dog Chew”. Please click here to read the entry. Also,please click here for the follow up taste testing blog entry titled “Palette’s note:Himalayan Dog Chew Part II”. ** You can get FREE one count of Buffalo trachea strip (Buffalo version of Moo-tubes sliced into strip) with every order! From June 12th through 25th, you can save more on Selected beef bully sticks. Because of our son’s surgery and recovery time, from June 17th through 25th, we will be closing for the shipping department. The code box will appear on the payment page after typing in the shipping information. The code cannot be combined. 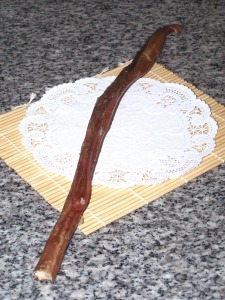 Grass-fed Australian beef bully sticks 18″ made in Australia. These are not stinky bully sticks. **If you become a fan of our Facebook page,you can get “Fan only” offer,and discounts. Please find “Yassy’s Gourmet Dog Kitchen” on Facebook. From June 5th through 11th, you can save more on Caribou Antlers. Gnaw-worthy 100% natural Caribou Antler harvested in US. Antlers last lot longer than bully sticks. These are great as long lasting chew. Current Caribou Antlers in stock is much heavier than previous delivery,and they are about approx 4″-7″. No flat Caribou Antlers available at this time. We offer this only when we can get them. Let’s watch how much Palette enjoys Caribou Antlers. If you are a blog subscriber, please click here to watch the video clip. You can read more on Caribou Antlers in the taste testing entry titled “Palette’s note: Caribou Antlers.To read the entry, please click here. To read more on long lasting chews,please click here. In the previous entry titled “Yassy’s note: Pregnancy week 33 week – 34 week“,I wrote about how my pregnancy went from week 33 through 34 week,and shared some of the sonogram picture of Liam with you. Here,I would like to share my pregnancy and Liam’s growth from 35 week through 37 week. June and July 2014 was busy months for us, preparing for the arrival of our son. Since I was in 34 weeks already then and not much time left to go look for things so, we decided to look for pediatrician next for his arrival. For us, choosing a pediatrician was one important decision we had to make before our son’s arrival. Personally, I like asking around friends and families about which doctors they like and why, which doctors they do not care for and why; take those as things to consider. Then, I like to search the doctors on our own also and finally, we pick a few places interested to go seeing. After that, we get to meet the doctors/staffs, look around inside the clinics and get the rough atmosphere of the clinic and how they run their business and how doctors are communicating with patients, then we can decide which one to go to. For me, these are the things that I was looking for in the pediatrician for Liam (our son) to be. ** No matter who we were to decide on, the doctor we wanted for our son had to be the one who accept our insurance policy. One of the pediatric clinic we went told us that they did not have room for us to become their patient. It was strange to be denied to get us become their new patient because I thought anyone could go see a doctor with their choice and there would not be “you can become our patient.” or “You cannot become our patient” conversation.We would not have those types of conversation back home in Japan because people can go see a doctor of their choice and rarely they get denied to be seen. It was good that we were not accepted after all because I realized that they had more than one doctor and our son might see the different doctors each time. The place was clean and nice and staff was ok but I felt everything we dealt with there in short time sounded very business-like and I did not care for the atmosphere as much. Another clinic we picked was good. The doctor’s philosophy;healthy diet brings good overall health, matched to mine and I was comfortable talking to her. For instance, she says….”a lack of fiber—naturally found in fruits and vegetables—and too much packaged macaroni and cheese could be the culprit.” for problem a kid can have. Her goal is to emphasize how important lifestyle and nutrition is, and how we really need to pay attention. Also, I found her effort to make the office kids friendly (with colors, with pictures and books and toys in the waiting room) was nice. The waiting room offers an orange couch and bright green chairs, a play table with vegetable toys, a bookshelf filled with many books for kids and interesting posters such as the one that says… “Eat food, not too much. Mostly plants” . You also get to watch food videos, exercise and healthy living will play during office hours. The five exam rooms are labeled according to fruits and vegetables. When we visited her, she told us that they use fruits and vegetable pictures for room instead of room numbers because it is easy to remember for kids and makes it fun for kids and make the clinic place to learn for healthy eating. When Liam was born and visited them for the first time with him, he was lead to the room “sweet pea room” right away so he can wait for the doctor there instead of waiting at the waiting room.I thought it was nice on their part. In addition to that, she got kitchen where she teaches classes for healthy eating for kids and parents and they have got their own garden to grow vegetables and I liked that place a lot. Nurse and staff were friendly and they made us patients feeling comfortable asking anything on our mind. I like the fact that she is not type of doctors who gives out antibiotics for everything to treat. I am happy with her for now most part. If anything to say,we tend to be waiting for the doctor to come in much longer than before now and, when she comes in, even if I got things that I wanted to ask her written on my notebook, sometimes, she is time pressed or something and I cannot ask her to my heart content. They got patient portal system and we can message her electronically any time we want if not emergency.I thought it was good idea at first. I tried using the system but there were times I did not get reply until we nudge them a few times, and I was giving up asking her things. The doctor says if not emergency questions, ask via patient portal. I think it is great if we get response in timely manner,though. One thing that I can say to new moms like me,who has lots of questions on child care because of being new to the field, I suggest to write down questions you like to ask your doctors so you do not forget to ask on the spot. It is hard for doctors to delaying the reply if asked face to face. I always write down questions on my notebook and I try to ask her as much as I can on the spot instead of asking via patient portal thing. From 35 week and after,at High risk OBGYN, we were told that Liam will be monitored 2/week for the growth and my placenta function etc.. I was told he is still growing but slower rate and now his growth went down from 16 percentile to 12 percentile. Doc said that if this number went under the 10 percentile, they need to intervene and probably would like to do amniocentesis to make sure his lung is fully developed and then if it is,then deliver him early. He told us that as long as he keeps growing, it makes him happy. On the positive note, while the sonographer was checking Liam,she told us Liam got hair by the day we were seen,and wiggling a lot and needed a little chasing game to take a picture of what she needed to take a picture of. Hearing all the assessment, Liam sounded like he would be out before full term week. One more month to the due date (August 2014) ..
As the due date approaches, we were busy with 2 OBGYN; high risk OBGYN and regular OBGYN and high risk one wanted me to come 2/week. Therefore, our schedule was very busy with all those checkups. When we went to high risk OBGYN, Liam’s head was way way low and the sonographer could not take a picture of his face so, she took a picture of hand and a foot. With hand pic, I can see it is a hand,but the foot picture is hard one.I still cannot see it is the foot even though sonographer typed out where the foot is. At the regular OBGYN, since they look at sonogram pics from high risk OBGYN,we did not do sonogram there but they checked blood pressure,weight, and belly size.The doc said everything looks good and I was doing good. Since she asked me if there were anything new high risk doc told us about so, I told about percentile got down last time when high risk doc checked measurement. She said not too worry because percentile is not accurate to the t and sometimes, it can be a little off and sometimes, depending on how it is measured, percentile can go up and down. I did not know when Liam would come out then but I hoped he will be able to stay in my belly as long as he can to learn to breathe and to make his lung mature. How doctor measure your babies.. According to pregnancy family education website,the measurement in centimeters from the top of your pubic bone to the top of your uterus (the fundus) should be about the same as the number of weeks you are pregnant, with an allowance of up to 2 cm either way. For example, if you are 26 weeks’ pregnant, you should measure between 24 and 28 cm. Your fundal height can be measured between 24 and 36-37 weeks, since once your baby “drops” into the pelvis in late pregnancy, the measurement may not reflect his or her true size. By late pregnancy, the baby can no longer fit on the screen of ultrasound and so his or her size will be calculated by combining several measurements in a mathematical formula, as is done at the 20-week scan. Measurements include the width of the head (biparietal diameter), circumference of the head, and the abdominal circumference, which are plotted on a graph over a period of time. The length of the upper leg bone (femur length) may also be measured. What percentile means is that,for example, out of a sample of 100 babies, a percentile value of 45% means your baby weighs more than 45 babies and weighs less than the other 55 babies. You can read the full article on how babies are measured at pregnancy family education page here. Another high risk OBGYN visit..
At the high risk OBGYN. I have done Biophysical test;ultrasound plus Non stress test (to check his heartbeat etc). Liam was very active during the sonogram but he got tired and sleepy and he fell asleep during the non stress test. So, he got the buzz,which made him wake up to monitor his heart beat. I remember I was feeling sorry to wake him up by buzz on my belly. At this point, doctor told us that he will measure him next time again and decide what to do next from there. There, he said that he would do the amniocenteses to make sure his lung is matured enough to breathe on his own, and if his lung was mature,then he would deliver him early. Amniocentesis is not done without risk and, I read one lady who did that resulted rupture the membrane and lost the baby or those who had bleeding during 1st and 2nd trimester has more higher risk of miscarriage by doing this test, or the study published on ncbi says “If elective delivery is being considered prior to 39 weeks’ gestation, ACOG currently recommends that fetal pulmonary maturity be confirmed to minimize the incidence of iatrogenic RDS. However, such recommendations are based primarily on studies carried out prior to the routine use of antenatal corticosteroids to accelerate lung maturity and the liberal use of ultrasound to confirm gestational age. Moreover, despite technological advances in the field, recent studies suggest that testing for fetal lung maturity at a more advanced gestational age (> 36 weeks) is neither reliable nor cost effective. It also can cause another complication such as uterine infection, water leakage and so on. Having matured lung is good so he can breathe on his own without being in the NICU, but I wonder amniocentesis is really necessary when you know there are risks involved like this especially with my situation. Liam was long waited son conceived via IVF and he was the last embryo remaining and last chance we could try hoping to be lucky to have a kid we can call of our own. I read that when the baby’s lung is not fully mature,it seems like those ladies had the test done again after 1 week from the initial amniocentesis test. I understand that doctor wants to keep baby inside the womb as long as possible and they do the repeated test to check the timing to take the baby out, but when there are even some risks that comes with it, I thought I would rather skip the test and if he needed to come out then, come out and being nursed at NICU sounds better than having all the possible risk of losing him.. However, Liam decided to make it easy for me to decide; he decided to come out before the even talk of doing the test or not. Before he decided to come out, we went to OBGYN 1-2 more times. One time we had to visit regular one and high risk one on the same day. We walked as fast as we could after the high risk OBGYN visit to visit regular OBGYN (they are in the same building), and I was blood drawn, weigh in, blood pressure, heartbeat check and we did strep B test and cervical test. The regular doctor said that my cervix is dilated and thin already and my body is ready to birth.That being said, some people be ready even weeks before the real birth time and some people do not dilate and thin and ready. So, she said if our high risk OBGYN decided to induce me because Liam’s lung was mature enough, the birth itself would be easier on me. At high risk OBGYN again..
At the high risk OBGYN, we did growth measurement. Since he is positioning himself way low for the head position, we got no pic then. That week was 35 week and 5 days (36th week) and, she said he weighed a little over 4lb. After the growth scan, I did non stress test;the recording of heartbeat for 20 minutes. Then, we talked to doctor after that. Doctor’s first suggestion was to do another growth scan 2 weeks later which puts me in 38th week because Liam is gaining weight and still growing. He did not mention what percentile Liam was on that day. That day, doctor told us that the amniocentesis test is another option and we can decide whether we do it or not on the first day in the 38th week. He let us decide but, if we do amniocentesis test, and lung was mature,then,we would have delivered the baby that week.If the lung was not mature enough,then, it seems the doctor said I would receive the steroid shots (2 kinds?) to develop Liam’s lung mature,and then, take Liam out from me. The most worried part of the test was miscarriage but he said I would not miscarriage because I am in the last trimester.Miscarriage is more of those who are in less than 20th weeks,he said.And the test will be done in about 10-15 min including prep and collecting fluid from my belly. When we were leaving the room, he said if I went into labor in 37th week, he would not stop it and let him comes out.That exactly what happened with Liam. I think he was overheard doctor’s talk from inside my belly. He was born on 36 week 2 days (37 week). I had lots of things to think/research about amniocentesis test and steroid shots to mature the lung of babies, but we got 2 more weeks to reply and we were planning to talk more and decide on that.I wanted as less invasive as possible, as natural as possible if I could choose it but, I was not sure if it was best for him to double checking his lung maturity in week 38..
2 days after since the high risk OBGYN visit, my in law mother visited us to help us out.It was really good timing because 2 days later, I went into labor. It was also good that me and my mother in law visited the hospital area together that morning because otherwise,she would not have known how to get to the hospital with my delivery bag that I prepared for the labor. Actually, we still talk about how Liam came about.It is because how I went into labor was unique and so memorable to our eyes and to others. Welcoming Liam to our family..
Liam sure had big entrance into our life from the start to the delivery time! 2 days after in law mother arrived to help us out, I had to go to 2 OBGYN back to back. In the morning, my mother in law took me to regular OBGYN and I had to direct her how to get to the hospital in her car. Then, in the afternoon, we went to high risk OBGYN and I was in the room with sonographer and right about finishing off the sonogram picture, I felt the big jump in my belly and noticed that my water broke.. So, I had to go to the emergency at the hospital,which was 2-3 minutes drive away. 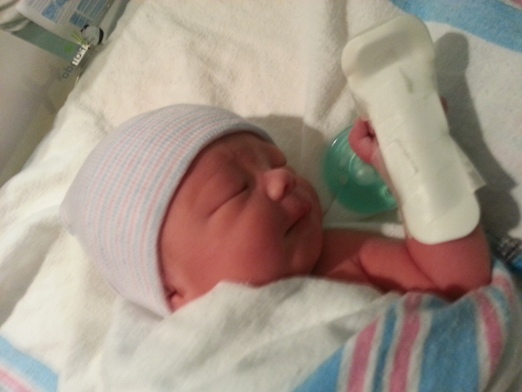 Then, I was admitted to deliver Liam at about 4pm. My contraction was every 2-3 min already then, and after about 7-8 hours later, he came out to meet us. He was sent to NICU right away after he came out to meet us, and I was released 3 days later from hospital. He could not come home with me..but we both went back to NICU every day to feed him. After Liam and us got settled, we went back to high risk OBGN office to show Liam to the doctor who was on vacation and to show nurse the result of my water break accident in the exam room. I think Liam determined his own future and made our decision for amniocentesis test very easy (he came earlier than testing day so we did not need to think about do the test or not do the test). At the labor room, I was very nervous because I did not know what to expect. I simply held tight the amulet my parents shipped to me for the easy delivery without complication plus my husband’s hands. I still remember I kept asking my husband if Liam was ok after Liam came out to our world because I did not get to hear his crying right away as I see on tv before. Liam needed a little bit of TLC and then a little bit of pause and then… finally I heard him crying. That first cry we heard, I got very emotional and started crying. I saw tears in my husband’s eye and nurse’s eyes as well. Me and my husband knew how hard,long, emotional long road it was for us to get to this point. Looking back everything we did to get to the birthing day, we both felt the joy we felt then was the one that we cannot express with words. My pregnancy journey has ended, and another parenting door opened. Being a mother for 10 months plus to Liam, I feel that parenting or being a mother is very hard job but it is such a rewarding job as well. I really enjoy every second I get to spend with our son. Despite the all the cries and feeding every so often when Liam was much younger and got me zombie every day due to lack of sleep,that little smile made my day super special. I enjoy watching over how he grows right in front of our eyes. I feel it was yesterday that I gave birth to Liam but already 10 months has passed! Stay tuned for more stories with Liam!